Hundreds of millions of people live and work in forests across the world. One vital aspect of their lives, yet largely unexamined, is the challenge of protecting and enhancing the unique relationship between the health of forests and the health of people. 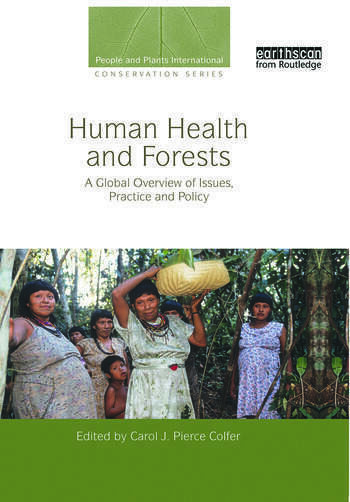 This book, written for a broad audience, is the first comprehensive introduction to the issues surrounding the health of people living in and around forests, particularly in Asia, South America and Africa. Part one is a set of synthesis chapters, addressing policy, public health, environmental conservation and ecological perspectives on health and forests (including women and child health, medicinal plants and viral diseases such as Ebola, SARS and Nipah Encephalitis). Part two takes a multi-lens approach to lead the reader to a more concrete and holistic understanding. It features case studies from around the world that cover important issues such as the links between HIV/AIDS and the forest sector, and between diet and health. Part three looks at the specific challenges to health care delivery in forested areas, including remoteness and the integration of traditional medicine with modern health care. The generous use of boxes with specific examples adds layers of depth to the analyses. The book concludes with a synthesis designed for use by practitioners and policymakers to work with forest dwellers to improve their health and their ecosystems. This book is a vital addition to the knowledge base of all professionals, academics and students working on forests, natural resources management, health and development worldwide. Carol J. Pierce Colfer is a Senior associate in the Governance Program at CIFOR and a Visiting Fellow at the Cornell Institute for International Food, Agriculture and Development in Ithaca, New York. Her work focuses on strengthening the voices of women and men who live in and near tropical forests. She is co-editor of Collaborative Governance of Tropical Landscapes (2011).